To start the request proposal, you can search for any of our Clinical Trials using the search form below. Once you locate a trial you are interested in you can request a proposal by clicking on the Trial Data link, then the Request Data button. Please visit this page on your desktop to search the database. 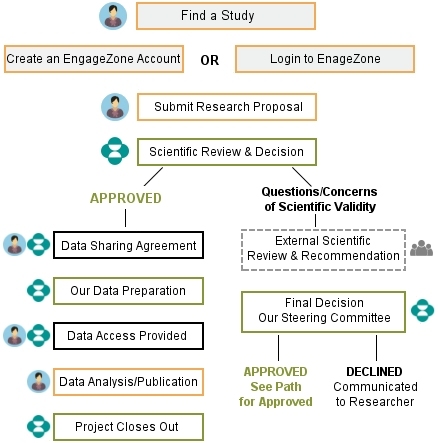 Prior to access to clinical trial data, the researcher must enter into a standard data sharing agreement with us. The data sharing agreement commits the researcher to use the data only for the stated research purposes and not to disclose the data to third parties. This is in line with data privacy legislation. In addition, researchers are expected to commit to transparency in the publication of their work. There are additional circumstances that may prevent the Company from sharing the requested data. The Company may not have the legal authority because the product was co-developed with a partner or obtained from an external partner under a contract that does not permit the disclosure. It may be difficult to ensure protection of the privacy and confidentiality of research participants. For example, small trials (e.g., with less than 50 participants) or studies of rare diseases may have too few participants to prevent re-identification of individuals. The informed consent may not allow for data sharing. There may be substantial practical constraints to providing access to the data (for example, size and complexity of databases or resources required to retrieve data from repositories and redact personally identifiable information from relevant documents). Didn't find a Company Study? If you didn't find a study on EngageZone, send us an email. Please include as much information about the study of interest as possible in your email, e.g. the study number, the NCT number from clinicaltrials.gov, and/or the citation to a study publication.